Clint Bowyer picked up the 1st last-place finish of his NASCAR Sprint Cup Series career in Saturday’s Toyota Owners 400 at the Richmond International Raceway when his #15 AAA Insurance Toyota fell out with suspension troubles after he completed 159 of the race’s 400 laps. The finish came in Bowyer’s 298th Cup start. It is not only Bowyer’s first last-place finish in Cup, but also his first last-place finish in a combined 490 Cup, Nationwide, and Truck Series starts dating back to his Nationwide debut at Texas on April 3, 2004. Among all active drivers who have raced full-time in Cup since Bowyer's Nationwide debut, only Jimmie Johnson, Kevin Harvick, and Kasey Kahne have yet to finish last in a single Cup Series points race. Harvick’s streak is the longest: 475 Cup starts with three 42nd-place finishes in 43-car fields. 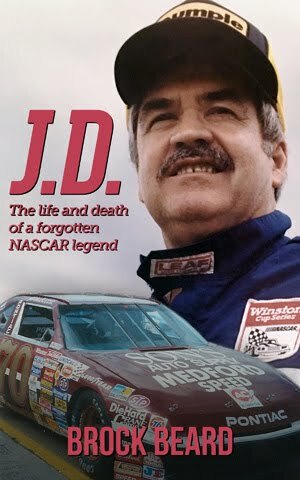 Johnson has finished 42nd twice in 444 Cup races. Kahne has finished 42nd four times in 369 Cup starts, all while starting in the top twenty. Bowyer began the 2014 season, his third with Michael Waltrip Racing, with high hopes. 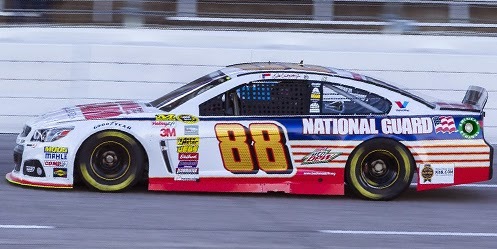 In his first season with the team in 2012, he scored three wins and a career-best runner-up finish in the point standings behind Brad Keselowski. Last year, however, Bowyer went winless, and was the subject of controversy last September at Richmond when he allegedly spun on purpose to help then-teammate Martin Truex, Jr. qualify for the Chase for the Sprint Cup. Truex lost his Chase berth - and his ride - while Bowyer picked up just two more Top Fives before season’s end. At Daytona this past February, Bowyer had a fast car for the Daytona 500, but it was destroyed in a spectacular flip on the last lap of his Budweiser Duel. Following a 42nd-place finish for an engine failure in the 500 itself, he scored just two top-ten finishes in the season’s first eight races: a 9th at Martinsville and an 8th at Texas. After an off week following his 12th-place run at Darlington, Richmond once again came up on the calendar. On Friday, Bowyer put up the 3rd-fastest time in the opening practice and was 25th in Happy Hour. A huge evening storm washed out qualifying, so Bowyer’s 3rd-fastest run netted him the 3rd spot on the starting grid. Darlington last-place finisher Dave Blaney and Las Vegas last-place finisher Michael McDowell missed the field as a result. In the race, Bowyer would carry sponsorship from AAA Insurance for the first time. By the time the field reached the backstretch for the first time, polesitter Kyle Larson had a claim to file. Going into the first corner, Bowyer looked to make a three-wide move on the inside of Larson and outside-polesitter Brad Keselowski. Bowyer made contact with Larson, spinning him into the outside wall, and giving the lead to Keselowski. On the restart, Larson sliced through the field quickly, dropping Joe Nemechek and the #66 Virginia Farm Bureau Toyota to the 43rd spot. Nemechek was the first car to lose a lap to Keselowski, but Josh Wise lost four laps before the competition caution by pitting his #98 Phil Parsons Racing Chevrolet. Wise, who had made contact with Kevin Harvick as Harvick tried to lap him, remained at the tail end of the field until a series of strange events bumped him up the field. On Lap 159, Cole Whitt, his #26 now fielded by BK Racing following the off-week disbandment of Swan Racing, suddenly had smoke pouring from his Scorpyd Toyota. He made it safely to pit road, but the caution came out when Bowyer found he had the exact same problem. Whitt returned to the track, only to find his right-front hub was on fire, and when Bowyer followed him, his own hub ignited with such intensity that it began to melt the front valence of his Toyota. Both Whitt and Bowyer pulled behind the wall. Whitt held 43rd at that point, having logged five fewer laps than Bowyer. But while Whitt returned to the track around Lap 190, Bowyer’s team found the damage too severe, and Bowyer fell to 43rd before the halfway mark. Whitt ended up 41st at the end of the night. 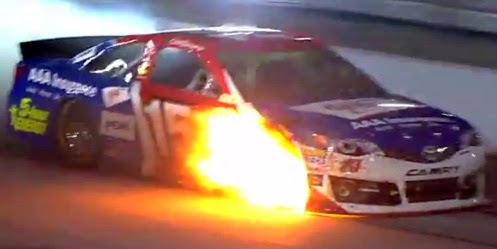 Finishing 42nd was Reed Sorenson, who fell victim to a car fire even more severe than those of Whitt and Bowyer. Sorenson’s #36 Tommy Baldwin Racing Chevrolet had thick black smoke in the cockpit when it pulled onto pit road, and swift work by a member of Kasey Kahne’s pit crew allowed him to get out quickly. Finishing ahead of Whitt in 40th was J.J. Yeley, making his first start of the year for Xxxtreme Motorsports. Xxxtreme’s #44 had sponsorship, but struggled to find speed. Yeley missed the races at Las Vegas and Texas and the team withdrew from Bristol to re-organize. But when Swan Racing folded for lack of sponsorship, the points for Parker Kligerman’s #30 were sold to Xxxtreme, putting Yeley into the field on points while leaving Kligerman without a ride. The team will switch from the #30 to the #44 next week at Talladega. Josh Wise finished 39th in the Phil Parsons Racing #98, just the fourth time in eight races he has finished in the bottom five. Next week at Talladega, Wise and the #98 will be sponsored by internet cryptocurrency DogeCoin in an effort to which I have also contributed. As of this writing, it appears Wise will be running the same Ford with which he finished 5th in February’s Budweiser Duel and last year Michael McDowell finished 9th in the Daytona 500 and 15th at Talladega. *The #15 has not finished last in a Cup Series race since April 29, 2007, when Paul Menard’s Menards Chevrolet fielded by DEI lost an engine after 22 laps of the Aaron’s 499. The number has not finished last in a Cup race at Richmond since March 3, 1996, when Wally Dallenbach, Jr.’s Hayes Modems Ford, fielded by Hall of Fame owner Bud Moore, crashed after 19 laps of the Pontiac Excitement 400. *This is the first last-place finish for Michael Waltrip Racing in a Cup race since November 11, 2012, when Martin Truex, Jr.’s #56 NAPA Toyota lost an engine after 10 laps of the AdvoCare 500 at Phoenix. *A Cup Series driver had never before finished last at Richmond due to suspension trouble. Prior to this season, the largest class for what is now the Sprint Cup Series’ Rookie of the Year was in 1994. The group of rookies included several drivers who would become series veterans. Among them were brothers Jeff Burton and 2002 Daytona 500 winner Ward Burton, current Nationwide Series regular Mike Wallace, two-time Chase qualifier Jeremy Mayfield, and current owner-driver Joe Nemechek. But the group also included a forty-year-old Nationwide Series driver from Shelby, North Carolina named Billy Standridge. Following the improbable championship run of the late Alan Kulwicki in 1992, several top drivers left multi-car programs to start their own teams. 1986 Daytona 500 winner Geoffrey Bodine bought Kulwicki’s team after his death in 1993, and in 1994 raced against another former Hendrick Motorsports driver-turned-owner, Ricky Rudd. The next season, Bill Elliott would leave the once-dominant Junior Johnson team to start his own program with sponsorship from former Johnson sponsor McDonald’s. Standridge would race Bodine, Rudd, Elliott, and the rest of the field, but with funding that matched the resources of the sport’s more longtime owner-drivers. An auto parts dealer by trade, Standridge worked his way through the Goody’s Dash Series, where he won four races over four seasons. In 1986, he moved to the NASCAR Nationwide Series, where he scored five Top Tens, including a career-best 6th at Martinsville in 1989 after fighting his way up from 31st on the grid. As with other underfunded drivers before him, perseverance and surprise would come to define Standridge’s career. He teamed with Berendt Johnson to make a run at the Cup Series, and after four DNQs in late 1993 and the 1994 Daytona 500, he nailed-down the 28th starting spot at Rockingham for his first Cup Series start. Though Standridge finished last that day in Rockingham after an early multi-car crash, the fact that he started the race at all was no small accomplishment. The large rookie class, combined for a with a glut of new start-up organizations like his, created a season where even fully-funded teams were regularly sent home - even Petty Enterprises. That Rockingham race alone saw seven drivers fail to qualify for the race, including Ward Burton, Jeremy Mayfield, IndyCar star Danny Sullivan, and the ageless James Hylton. Standridge made seven of his eighteen other attempts that season, and in four of those had to beat at least four other drivers to make the show. Perhaps the most challenging qualifying day of his career came at Charlotte that fall, where he made the field while twelve others did not, including Melling Racing, RaDiUs Motorsports, and cars owned by Dave Marcis and Jimmy Means. Standridge’s best finish of his Cup career came on March 26, 1995 at the Darlington Raceway, where he dodged the carnage of fifteen cautions to climb from 36th to a 14th-place finish. His next Cup start came more than a year later in late 1996, when he replaced Randy MacDonald as driver of Jim Wilson’s #78 Fords. He remained with Wilson’s part-time organization through the first part of the 1997 season, but in the latter part of the season, returned to owning and driving his familiar #47. It was in his final few starts, and at the sport’s biggest tracks, where Standridge wrote the most impressive chapter of his career. Following a career-best 7th-place qualifying run for Wilson’s team in the 1997 Pepsi 400, Standridge fielded his flat white Ford Thunderbird in the fall race at Talladega. Carrying sponsorship from Cofab Steel and Jayski’s Silly Season Site, founded just over a year earlier, Standridge locked-up the 26th starting spot. And, like in his first start, Ward Burton was one of the drivers he bumped from the field. Standridge followed this up by qualifying for all four restrictor-plate races of the 1998 season, knocking out between five and fourteen drivers in each. He raced his way into his lone Daytona 500 start with a 15th-place run in his qualifier, giving him one of the best seats in the house for the day Dale Earnhardt claimed his only victory in the race. 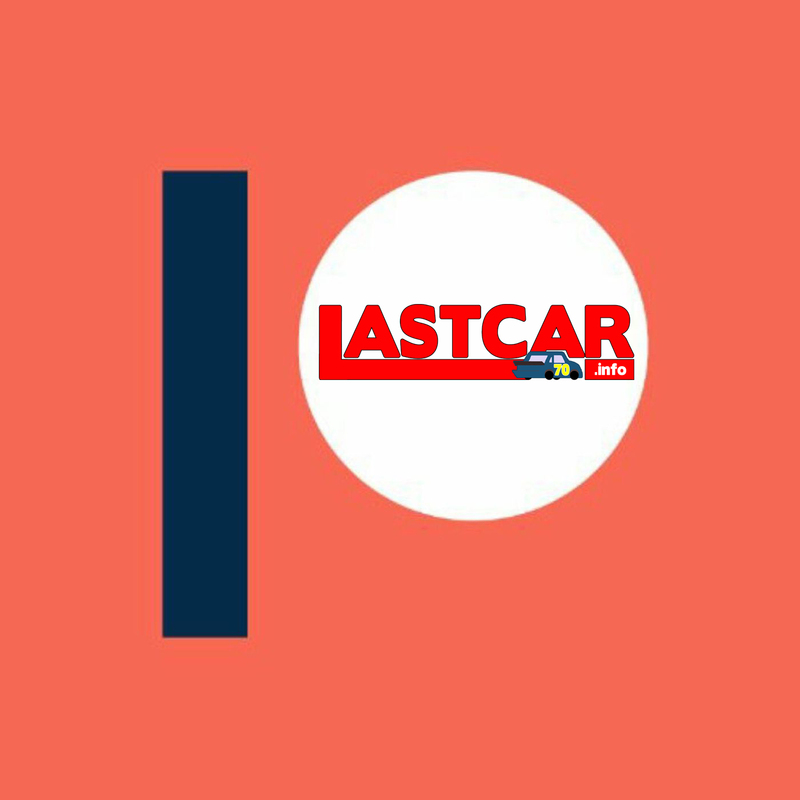 And, in all four races, Standridge carried logos for what was perhaps racing’s first online Kickstarters - TeamFansCanRace.com. Standridge made one more bid at the 500 in 1999, then ended his Cup career where it began with a DNQ at Rockingham. On Friday, not long after word of Standridge’s battle with cancer, Nationwide Series owner Johnny Davis honored the driver for whom he used to work as crew chief for many of those starts. With the number 47 and Standridge’s signature on the C-panel of Davis’ three cars, drivers Landon Cassill, Kevin Lepage, and Jeffery Earnhardt all finished in the Top 20 at Darlington, scene of Standridge’s best career Cup finish in 1995. Standridge passed away early the next morning. Official NASCAR results will show his average finish of 33.7. 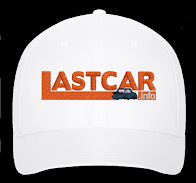 Here at LASTCAR, he is credited with five last-place finishes. But the true legacy of Billy Standridge is that making the grid for a NASCAR Sprint Cup Series race is never a guarantee, and you just never know who the hero of the next qualifying session will be. Dave Blaney picked up the 22nd last-place finish of his NASCAR Sprint Cup Series career in Saturday’s Bojangles’ Southern 500 at the Darlington Raceway when his unsponsored #77 Randy Humphrey Racing Ford fell out with brake problems after he completed 65 of the race’s 374 laps. The finish was Blaney’s first of the season and his first in a Cup race in nearly a year, dating back to last April’s race at Kansas, thirty-six races ago. Blaney is the eighth different last-place finisher in eight Cup races in 2014. This last happened in 2012, when the streak ended at Richmond. Since the Cup schedule was shortened in 1972, there have only been five other seasons with longer streaks. The all-time record is 21, set in 1978 and equaled in 1993. The others are 1984 (20 in a row), then 1995 and 2008 (17 each). Blaney has endured an extremely difficult start to the 2014 season. 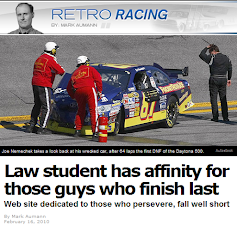 After nearly four years of helping Tommy Baldwin Racing get up to speed, Blaney lost his ride to rookie Michael Annett. He found a home with another start-up team owned by Randy Humphrey, who with Phil Parsons in 2009 and 2010 co-owned the PRISM Motorsports entries Blaney drove those two seasons. Humphrey and Parsons parted ways in 2012, and when Humphrey’s subsequent partnership with TriStar Motorsports ended last season, Humphrey signed Blaney to run for his own team. Blaney arrived at Daytona behind the wheel of the team’s only restrictor-plate car, a Fusion purchased from Germain Racing with the #77 used in place of Germain’s #13. Blaney was slow in qualifying, but was ready to race his way into his fourth consecutive Daytona 500 in the Gatorade Duels. Unfortunately, Blaney’s only car was destroyed in a grinding practice crash, forcing the team to withdraw. Humphrey’s team struggled to adjust to NASCAR’s new qualifying format. They failed to qualify for the next four races, then withdrew from the next two. Finally, at Texas, Blaney squeezed into the field in the 35th starting spot, besting four “go-or-go-homers,” then nearly ran the whole race before steering issues left him 41st. Driver and team looked to build on this at Darlington, scene of one of Blaney’s best career finishes in 2003. At Darlington, Blaney again made the field, timing in 36th at an average speed of 179.606 mph, bumping David Reutimann’s Front Row Motorsports #35 out of the field. He had bested Reutimann in both practice sessions, turning in the 32nd-fastest time in the opening practice session and 33rd in Happy Hour. 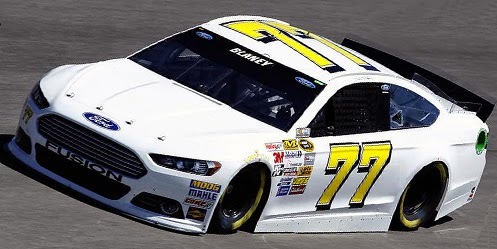 However, Blaney’s #77 Ford was still flat white without any sponsorship. In the race, Blaney was the first driver to take 43rd from Joe Nemechek when Blaney pulled the #77 behind the wall on Lap 33. Blaney returned to the track on Lap 87 to catch Ryan Truex, who had crashed his #83 Borla Exhaust Toyota on Lap 42. Blaney passed Truex, only to fall ot once more around Lap 115, still 30 laps short of catching Michael Annett, who also lost several laps after a cut tire on Lap 94. On Lap 129, Truex then returned to the track 88 laps down, and he knocked Blaney to 43rd for good on Lap 155. Annett returned to the track after Lap 200 before another cut tire knocked him out of the race after he completed less than ten more circuits. Truex ended up passing Paul Menard, who on Friday broke the track record in the first round of qualifying, but also had a pair of tire issues in the middle stages of the race. Like Menard, Truex finished the race under power, though fifteen laps from the overheating Chevrolet of Annett’s teammate Reed Sorenson, who rounded out the Bottom Five. *This is the first last-place finish for the #77 since June 26, 2011, when P.J. Jones’ Speed Energy / GNC Dodge broke the suspension after 5 laps of the Toyota / Save Mart 350 at the Sonoma Raceway. The number hasn’t finished last here since March 24, 1996, when Bobby Hillin, Jr.’s Jasper Engines Ford was involved in a crash after 29 laps of the TranSouth Financial 400. *This is Blaney’s first last-place finish in a Cup Series race at Darlington. *This is the first last-place finish for a Randy Humphrey-owned Cup car since last July at New Hampshire, when Mike Bliss’ #19 Plinker Tactical Toyota fell out with rear gear problems after 75 laps of the Camping World RV Sales 301. Blake Koch picked up the 8th last-place finish of his NASCAR Nationwide Series career in Friday’s VFW Sport Clips Help a Hero 200 at the Darlington Raceway when his #10 SupportMilitary.org Toyota fell out with a vibration after he completed 2 of the race’s 147 laps. The finish was Koch’s fourth of the 2014 season and his second in a row, following last week’s run at Texas. For TriStar Motorsports, it is their twelfth consecutive last-place finish. Jeff Green, NASCAR’s all-time last-place finisher and the driver with this season’s other three last-place runs, finished next-to-last in TriStar’s #91, four laps behind. 40 cars showed up to fill the 40-car field, so Koch secured the final starting spot for the second consecutive week, this time putting up a lap of 156.015 mph. Koch only participated in the final practice session, putting up the 37th-fastest time out of 39 drivers. The only driver to skip that session was teammate Jeff Green, who started two spots in front of Koch in 38th. At the start of the race, Koch remained at the back, then pulled behind the wall in the opening laps. Green followed four laps later. Ahead of Koch and Green in the finishing order was Matt DiBenedetto, who earned his sixth-consecutive bottom-five finish in The Motorsports Group’s #46 Chevrolet. Ryan Sieg came home 37th following a hard crash on the backstretch in his #39 Damn Good Jerky Chevrolet. Rounding out the Bottom Five was Matt Carter, who gave the JGL Racing #13 its third Bottom Five in its last three starts and its second in a row. *This is the first Nationwide Series last-place finish for Koch, TriStar Motorsports, and the #10 at Darlington. 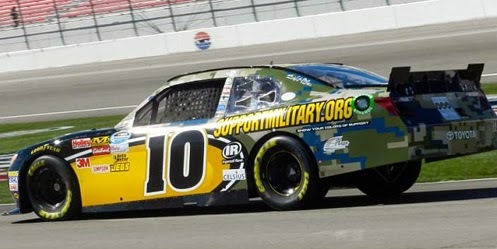 Blake Koch picked up the 7th last-place finish of his NASCAR Nationwide Series career in Friday’s O’Reilly Auto Parts 300 at the Texas Motor Speedway when his #10 SupportMilitary.org Toyota fell out with a vibration after he completed 2 of the race’s 200 laps. The finish was Koch’s third of 2014 and his first since Bristol, two races ago. Koch and teammate Jeff Green have each scored half of the season’s six last-place finishes. Koch also extends TriStar’s last-place streak to eleven consecutive races. Koch was 35th-fastest of the 40 entered cars in the first practice session, did not participate in Happy Hour, and secured the 40th and final starting spot with an average speed of 170.929 mph. In the race, Koch’s Toyota was the first car behind the wall, but the battle for 39th stretched longer than usual. 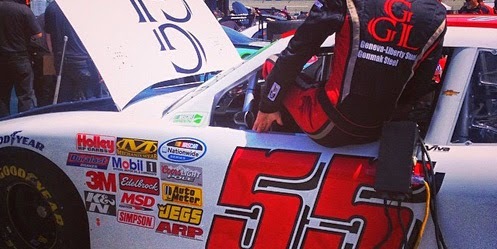 It first appeared that Derrike Cope, once a last-place record holder, would edge Matt DiBenedetto’s #46 The Motorsports Group Chevrolet for 39th. Cope lost laps in the early stages with engine woes on his #70 Youtheory Chevrolet. However, Cope returned to the track just long enough to pass DiBendetto before the engine let go. All three of DiBenedetto’s next-to-last-place finishes have come during Koch’s last-place runs in 2014. Rounding out the Bottom Five were two entries from Gregg Mixon’s JGL Racing Team. Mike Wallace, who finished no worse than 26th in his first five starts in Mixon’s #28 Dodge, moved to the #13 Toyota previously driven by Matt Carter at Bristol and fell out after 23 laps. Teammate Derek White, who jumped in Wallace’s #28, fell out with transmission problems six laps later. The third JGL entry, a #93 Dodge fielded by J.J. Yeley, finished 16th. *TriStar Motorsports’ #10 Toyota has now finished last in three consecutive Nationwide Series races at Texas, and four of the last five. It is, however, Koch’s first last-place finish at this track.